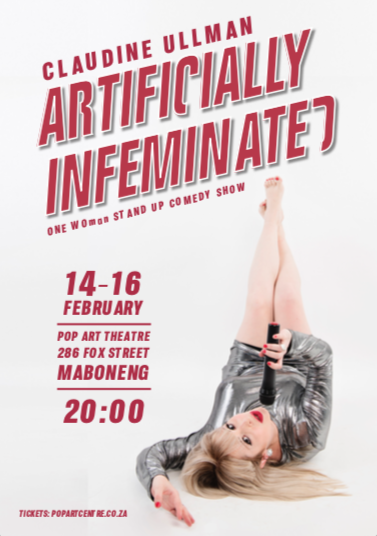 Artificially Infeminated is Claudine’s debut one woman stand up comedy show that explores the intricacies of being cis gender female, pale white, chubby Jewish and middle child in Jo’burg #millenialslovelabels. Claudine explores everything from her childhood infatuation with Raphael (the Teenage Mutant Ninja Turtle), to her current infatuation with her double chin. Other topics include thigh gaps, complaining and how watching The Secret repeatedly isn’t the secret to getting rich – which is the real secret – are you following? She discusses deep questions that explore the human condition like the battle between men and women and the battle between gym and tennis biscuits…. This show is a fresh, fun and surprising take on stand up comedy and will leave you thigh clapping for more. If you don’t like it, you can always ask to speak to the manager.